T-Mobile is still cruising towards a $26 billion merger with Sprint, a deal that would combine the third- and fourth-biggest wireless carriers in the U.S. into one massive company. And after the deal was announced in April 2018, the Washington Post reported on Wednesday, T-Mobile executives quickly grew fond of a D.C. hotel run by Donald Trump. ... T-Mobile executives have returned to President Trump’s hotel repeatedly since then, according to eyewitnesses and hotel documents obtained by The Washington Post. 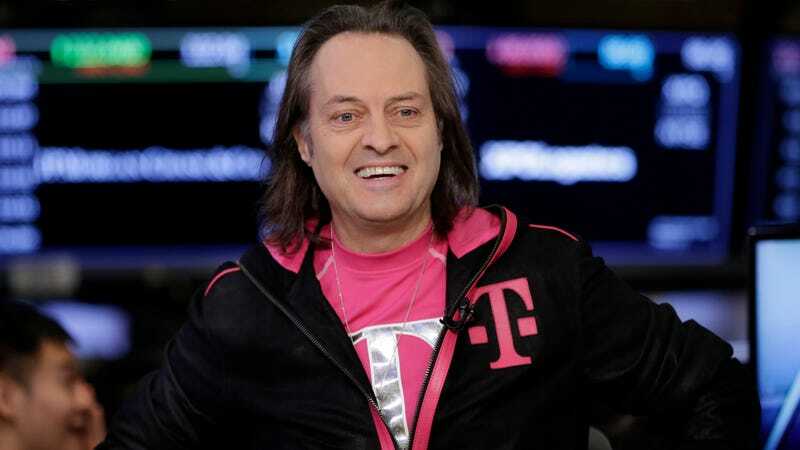 By mid-June, seven weeks after the announcement of the merger, hotel records indicated that one T-Mobile executive was making his 10th visit to the hotel. Legere appears to have made at least four visits to the Trump hotel, walking the lobby in his T-Mobile gear. A “VIP Arrivals” list of prominent guests at the hotel and obtained by the Post “showed 38 nights of hotel stays by the T-Mobile executives; because the Post’s data is incomplete, the number could be higher.” According to the paper, neither T-Mobile or the Trump Organization disputed the number. The hotel in question has long drawn concern from Trump critics who note that the president never divested from his business holdings and simply handwaved away potential conflict-of-interest by claiming his idiot sons run them now. Everyone from politicians and powerbrokers to Saudi-funded lobbyists has ended up staying there as Trump moved into the Oval Office—situations that sound suspiciously like attempts to pump money into Trump’s coffers, or at least to curry favor with him and his administration. On Wednesday, the Inspector General for the General Services Administration (GSA) released a damning report saying that officials in charge of the federally-owned Old Post Office Building, where the hotel is located, improperly ignored constitutional concerns when renewing Trump’s lease in 2016. It surely is convenient for meetings with the DOJ, an agency with an anti-trust division currently reviewing the T-Mobile/Sprint deal and that sometimes intervenes to stop such mergers. (That’s not entirely sarcasm; a Google search shows the hotel is one block away from DOJ headquarters.) Trump’s DOJ has seemingly little interest in blocking the deal; its antitrust process is supposed to be insulated from executive branch pressure, though the president’s myriad vendettas have threatened to pollute it before. According to the Post, soon after they ran into Legere at the Trump International Hotel, the CEO began tweeting how much he loved the bar at another hotel.